Saga pedo, a species of bush cricket. Photograph courtesy of M. Steadman. We get a number of enquiries each year from the general public asking us to identify various insects that they have found in their homes or gardens. The majority of these enquiries are of British insects (as you might expect) but we also get a handful of more exotic and exciting insects that people have seen whilst on their travels in other countries. The photograph above was sent to us by Mr M. Steadman and was taken whilst on holiday in Turkey. 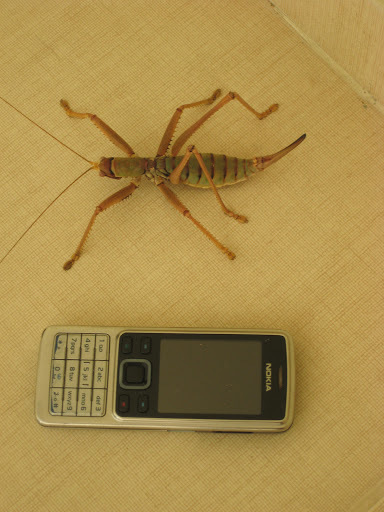 The large and very impressive insect pictured is Saga pedo- a species of cricket belonging to the family Tettigonidae. It is an unusual species for a number of reasons but in particular because it is predatory. Nearly all crickets are herbivores, feeding on a wide variety of plant species. Saga pedo feeds primarily on insects and has been known to cannabilise members of its own species. There are even a number of reports of this species hunting small reptiles and young birds. This species is also unusual because it appears to reproduce asexually by parthenogenesis. Specimens are therefore female and can be identified by the long spear shaped ovipositor at the rear of their body (as seen in the photograph above). There has yet to be a reliable sighting of a male specimen of Saga pedo. 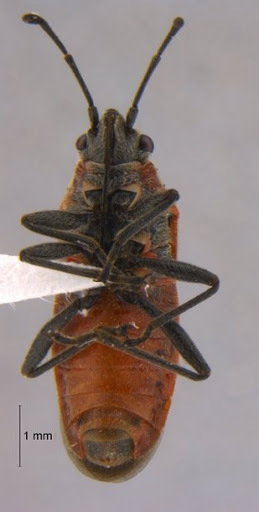 Arocatus longiceps is in the insect order Hemiptera, commonly called ‘true bugs’ and is part of the family called Lygaeidae often referred to as seed bugs, due to their feeding behaviour on plant seeds. 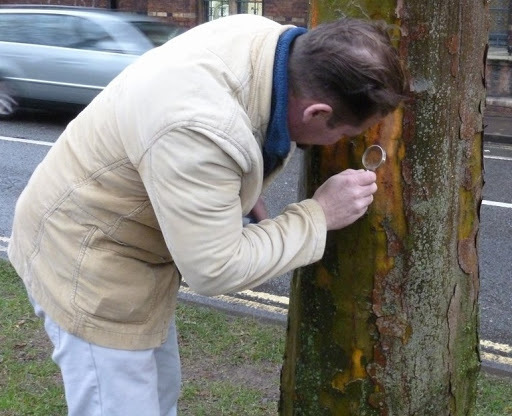 This species is not native to the UK and was first discovered in Britain during 2007 on plane trees in the grounds of the Natural History Museum, London. This appearance made the bug quite famous; it even featured on the BBC News in 2008 as a new, apparently unidentifiable species. 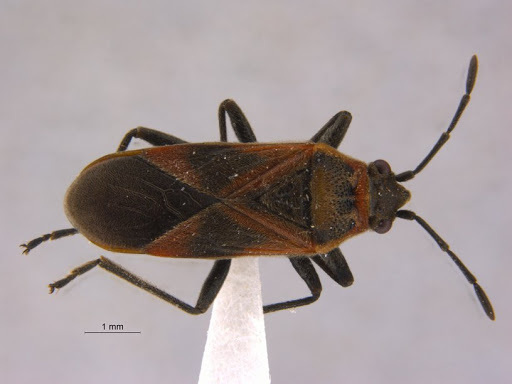 Originally this species was determined as Arocatus roselii, however specialist researchers in seed bugs were consulted and the bug was finally identified as Arocatus longiceps an eastern Mediterranean species which has been spreading across Europe over the last few decades. The species has mainly been recorded in the London area; but on the 30th November 2012 two specimens were found in the basement rooms at the Museum. This is a new record for Oxfordshire (Flanagan & Ryan, personal communication) and is probably the most Northerly record so far. This bug is commonly found across Europe, and in October Amoret saw quite a few during a visit to Prague. The host plant is the plane tree; when the specimens were found in the museum, it prompted us to see whether there were more. 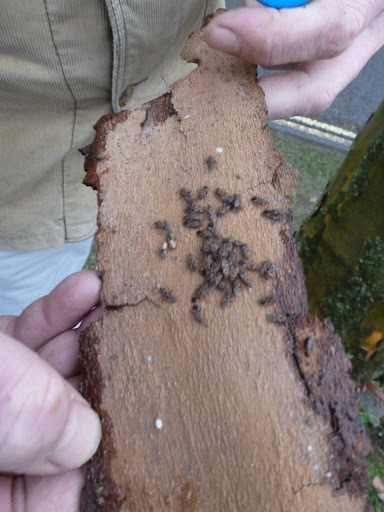 As the photos below show, upon searching the plane trees outside the museum, we found an abundance of this bug. Chris Jarvis of the Education Department uses his detective skills to find the bug. A large number of Arocatus longiceps were found beneath the bark. They overwinter as adults in clusters. 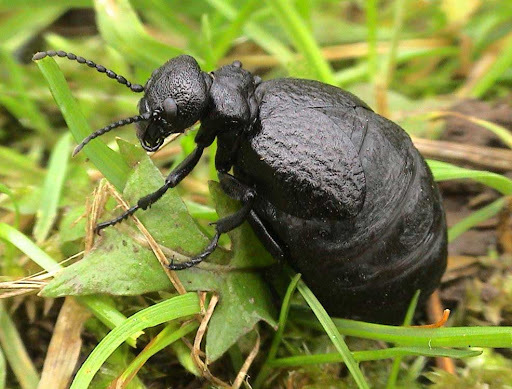 A species of Oil Beetle, Meloe mediterraneus, which was previously thought to be extinct in the UK, has been rediscovered as part of the on-going Oil Beetle conservation project being run by Buglife. Female Meloe mediterraneus. Photograph courtesy of John Walters. 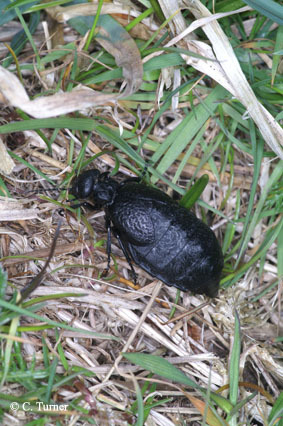 The beetles were found at Bolt Head, a National Trust site in South Devon by a local naturalist who was carrying out a study for the Oil Beetle conservation project. The discovery was confirmed by Darren Mann who is a specialist in British Oil Beetles. It is the first record for this species in over 100 years and the first ever for Southwest England. It is currently the only site that this species has been found at but it is hoped that with further survey work more populations can be found in other areas of the county. Prior to its rediscovery, the Mediterranean Oil Beetle was only known to have ever existed in the east of the country- in Essex and Kent. The beetle was last sighted in Kent in 1906 and was thought to be extinct in the UK until rediscovered this year. One reason for Meloe mediterraneus remaining undiscovered was that the specimens were mistaken for the similar looking Rugged Oil Beetle, Meloe rugosus (previously blogged about by us here). The adult Mediterranean Oil Beetle is slightly larger than the Rugged Oil Beetle, and has a larger thorax. The Rugged Oil Beetle also has a crease down the centre of the thorax that is absent in the Mediterranean Oil Beetle. 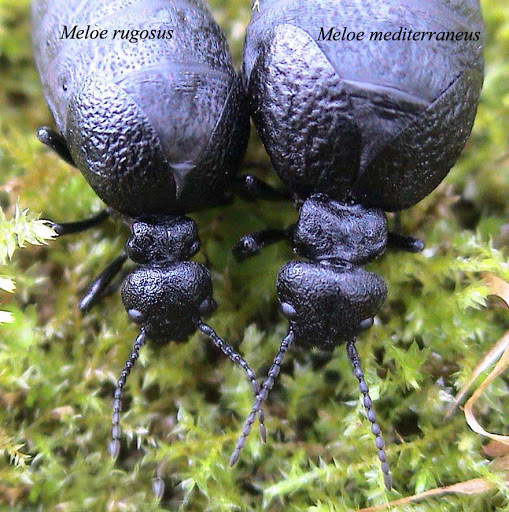 Photograph to illustrate the differences between Meloe rugosus (left) and Meloe mediterraneus. Note the groove on the thorax of Meloe rugosus. Photograph courtesy of John Walters. 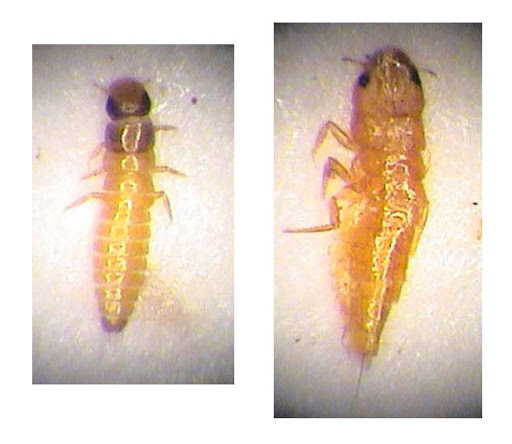 The triungulins (larvae) are possibly even more distinctive, with those of Meloe mediterraneus being entirely orange whilst those of Meloe rugosus have an obvious dark head. Triungulin of Meloe rugosus (left) and Meloe mediterraneus (right). Photographs courtesy of John Walters.